I need a break. Things have been rather stressful due to an impending move in Santa Fe. On top of that, I’ve been struggling with how to frame a touchy blog about how humanity needs to course-correct–or something. So I decided to relax and write instead about my recent experience with a potato. But first, some background. Ever since I helped my sister Kate with her Red Wriggler Ranch years ago, I have kept composting worms to process my vegetable garbage. Since there’s only me in the house, I sometimes go short on food for them, so I have to supplement. Organic is my goal, and I may even cook the produce, as in a russet potato. The worms love a baked potato. I split it in half and lay it down, skin side up. The worms swarm underneath, and I think they may mate there as well as feed, though I’m not sure. It was potato-baking time the other day, but I started late in the evening. Due to the high altitude here, it typically takes longer than an hour to bake them at 425º. 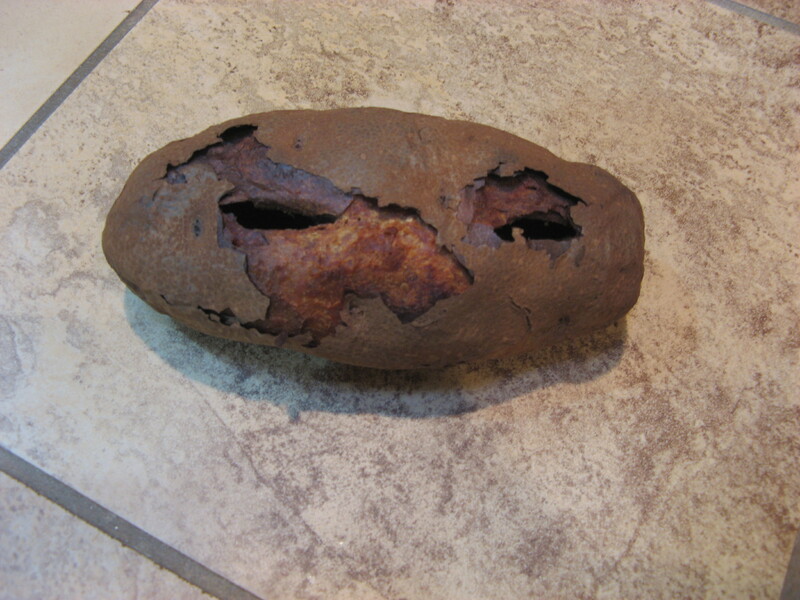 That night I decided to turn the oven off after the prescribed hour and leave the potato inside until morning. I didn’t want to burn the worms, and I figured a little extra cooking as the oven cooled wouldn’t hurt. When I retrieved the potato the next day, I was stunned. The first thing I noticed when I removed the pan was that the potato had gone light as a feather. There were two large holes that I had poked to let moisture escape, and when I looked inside I couldn’t see anything. Nothing. The potato shell was almost as hard as wood. If I tried to crush it with my hands, I would bleed. Where did everything go? How did it go? Not even a crumb rattled inside the shell. There was nothing for it but to put the potato in the trash and cook an artichoke for dinner. The worms love my leftover leaves. They eat them up, totally up. The worms were happy, but the potato shell haunted me. I retrieved it from the trash the next day. It was as hard as ever, but now I noticed that it had taken on a kind of personality. I could see a face in the skin. The two holes now looked like eyes, and there was a little pursed lip where the skin had torn. After I took a portrait photo, my mind flew to the Great Famine in Ireland from 1845 to 1849. It had resulted from increasing dependence on potatoes for food. The potatoes had apparently become infected with a strain of P. infestans that originated in the Americas (probably Mexico) and then spread to Europe. The contaminated potatoes killed over a million people in Ireland. Now my mind returned to the present and all of the pigs and cattle and crops recently drowned in the floods in the Midwest. Is the potato oracular? And what is it saying? I will leave it at this, and I invite the comments of readers. Do you see the face in the potato? What do you think it could mean? As I said in the beginning, we need to be alert to guidance in these troubled times. Looks like your potato has quite an interesting personality. It is winking!!! it looks like it spent too much time on the beach. Wow, Ellen, that is one bizarre-looking potato! I think it is lovely that you are so considerate of those worms… Bon Appetit! We use our trusty microwave. It takes 8-10 minutes depending on size of potato.